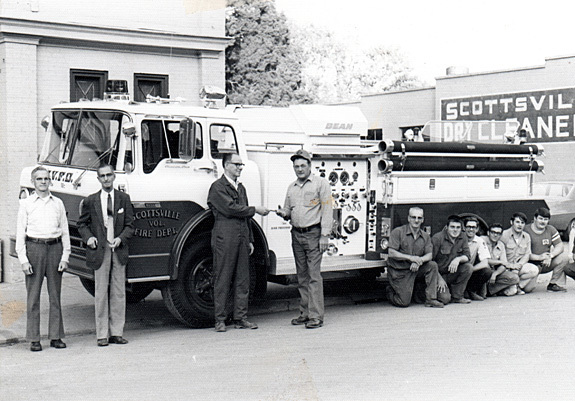 Comments: Scottsville made a concerted effort to keep the town safe from fires since the beginning of the 1900's. 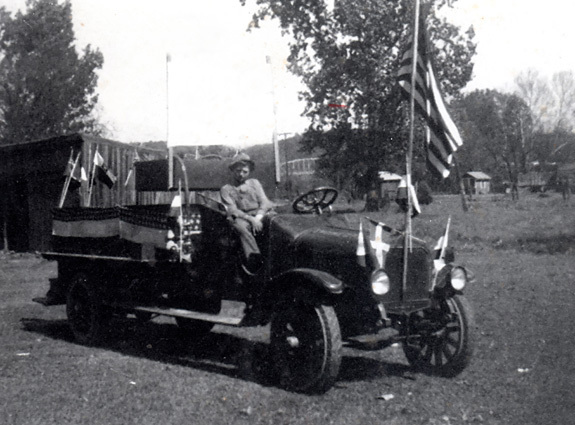 A bucket brigade formed in 1905, and the town fire hydrants were installed in 1916. That same year, the volunteer fire fighters raised enough money to buy two fire hose reel carts. These carts were heavy and cumbersome and had to be pulled by six or eight men. 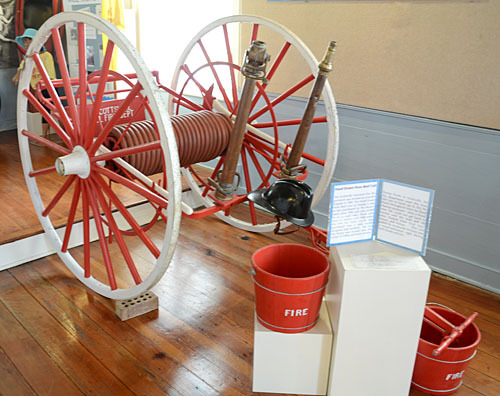 According to Harold Parr, a Scottsville Fire Chief in the 1940's, "By the time the volunteer firemen pulled those heavy carts up the church street hill (from St. John's Church to the Scottsville Baptist Church), the men were so tired, they didn't have the strength to hold a hose (one of these carts is on prominent display at the Scottsville Museum together with some of the fire buckets; see photo above). Each cart hooked up to one for Scottsville's fire hydrants, but the water pressure was not sufficient to spray water far enough for most fires. Most of the fire fighting with these carts concentrated on saving adjacent properties while letting the involved structure burn itself out. About 15 years later, enough funds existed for the SVFD to purchase an $8,000 state-of-the-art John Bean truck with the latest spray equipment. 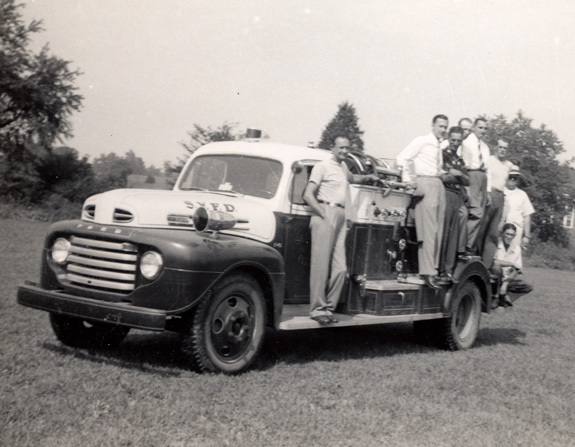 Shortly thereafter the SVFD purchased a second-hand truck chassis that was outfitted with a large capacity water tank for use out in the country where no fire hydrants were available. SVFD receives the keys to their new Bean Fire Truck; Scottsville Mayor Raymon Thacker stands second from left. The SVFD has been led by at least 14 fire chiefs since 1941. Several chiefs served multiple terms, and J.O. Jordan served 10 years (1988-1994, 1997-2000). Scottsville's current fire chief has already served nine years and on track to beat Jordan's impressive record. The Scottsville Fire Department moved from the old Victory Theater location on Valley Street to 141 Irish Road across from the Scottsville shopping center. SVFD serves an area of over 200 square miles and more than 10,000 residents. The amount of fire calls serviced by SVFD averages over 500 annually, and naturally they would like that count to drop significantly. In 2011, SVFD has over 40 trained volunteers and a fleet of 11 vehicles, including a hazardous materials containment trailer. In addition fire protection, the SVFD protects Scottsville from the mighty waters of the James River. Volunteers regularly inspect the flood water pumps and the levee and advises the Scottsville Town government of anything amiss. When a flood threatens, SVFD spends hours installing the levee flood gates, diverting traffic, and running the pumps until all threat of flooding has passed. On another more festive note, SVFD organizes the town's annual Independence Day Parade and the spectacular fireworks in the evening. The SVFD receives no state or federal funds. Some funding comes from the County of Albemarle and some grant money is available. Volunteers run all aspects of SVFD including organizing and executing fundraisers to pay for equipment and supplies. To support the department, the very active SVFD's Ladies Auxiliary organizes beauty pageants ranging from Tiny Miss Scottsville to Miss Scottsville and Little Mister Firefighter. An undated newspaper photograph shows a lively dance at a Fireman's Fair where ..."a good part of the town shows up." Other SVFD fundraising events have included spaghetti dinners, Halloween parties, cake sales, and Santa Claus visits. On Saturday, Oct. 1, 2010, SVFD held a special 75th anniversary celebration at their firehouse was held. A man very much involved in the volunteer fire department for most of its 75 years, Mayor Emeritus A. Raymon Thacker, gave the keynote address.